One problem many artists have is we lack discernment. It’s easy to get trapped in all-or-nothing thinking. If we defy family in pursuit of our art and something stops working properly, out of pride often we will persist even when the very thing we are attempting is the largest reason we will fail. We keep reworking that first novel over and over. We keep querying the first novel and won’t move on until we get an agent. We keep writing in the same genre even though it might not be the best fit for our voice. We keep marketing the first self-published book and don’t move forward and keep writing more books and better books. This is why I do consulting. Yes, it’s $160 for three hours, but I’ve yet to meet a book I couldn’t wrangle and make behave. A skilled outside perspective is priceless and will save time and money (and good content editors are NOT cheap). People like me can help you quit the book that isn’t working and start writing the book you originally had in mind. I like to say, “Persistence looks a lot like stupid.” The act of never giving up is noble, but never giving up on the wrong things is a formula to fail. We have to learn to detect the difference between quitting a tactic and quitting a dream. If I am trying to climb Mt. Everest, but I am repeatedly failing at climbing the one side, which is a sheer rock face with no way to get a footing, then it is suicide to keep trying the same thing. If, however, I regroup, hike back to the bottom and take another way up the mountain, I am a quitter…but I am NOT a failure. Most of us are lousy at knowing how and when to quit. This is one of the reasons it is a good idea to surround ourselves with successful people, because successful people are expert quitters. When I started out, I had all the wrong mentors. I had writer pals who quit writing when it was boring or who quit querying after a handful of rejections. They quit attending critique because they got their feelings hurt when people didn’t rave their book was the best thing since kitten calendars. All this wrong kind of quitting is easy to fall into. Excuses are free, but they cost us everything. It all started with the DFW Writer’s Workshop. I attended and met people living the life I wanted to have…the life of a professional writer. They were the same as me, and yet very different. When I attended my first conference, I found myself being pushed to yet a higher level. I met and stalked Candy Havens. Candy is an excellent quitter. She wrote her first bad book and didn’t spend the next six years trying to resurrect it. She sought training and experts and moved forward. She quit outside hobbies and friends that took away from her goal of becoming a professional author. Theresa Ragan was rejected by traditional publishers for over twenty years. She finally self-published and has now sold hundreds of thousands of books. NY tried to offer her a contract and she turned them down. 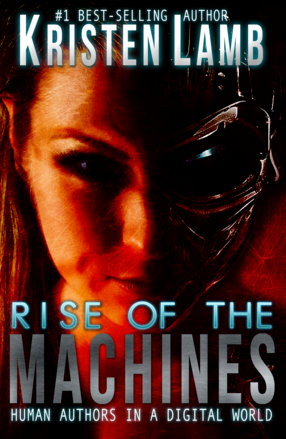 I turned in a hundred page proposal for Rise of the Machines—Human Authors in a Digital World in the summer of 2011 to a premiere agent, a DREAM agent. But, after NY ignoring it for over two years? I thanked my agent for his efforts and published it myself. We need to always be moving forward, and sometimes pressing on requires letting go. We can’t grab hold of the new if we are hanging on to the old. If something isn’t working QUIT. Move on! If we have to defend and justify what we are doing there’s something wrong. No, I mean mentally QUIT, then hire yourself to the dream. Screw aspiring. Aspiring is for pansies. It takes guts to be a writer. It takes guts to be any kind of creative professional. Hire yourself to the job you dream about. TODAY. Again, Everything is the enemy. Friends and family will want you to keep being the maid and the taxi and the babysitter and the buddy who can spend all day shoe-shopping. Many of us will try to keep being Everything to everyone and we’ll just try to “fit in” writing, but that is the lie that will kill the dream. We can’t be Everything! A new quote I have etched in my brain is, I can be respected or popular. I can’t be both. We must learn when to quit and to be firm in quitting. Others have the right to be disappointed, but they’ll get over it. And, if they really love us they will get over it quickly and be happy for our resolve to reach our dreams. If they don’t? They’re dead weight and it’s better to cull them out of our life sooner than later.